Trigger warning! Don’t watch the video if you suffer from epilepsy(?) or conditions that prevent you from watching fast (and shaky) videos. While you slow your heart rate down, let me explain to you why I love this recipe so much. I’m a person who absolutely loves cheese and anything cheesy tasting, but my mind and my body physically rejects anything with too much actual cheese and cream and all that good stuff (I think the technical name is dairy). This is my way of making the cheesiest tasting comfort food (just in time for Autumn and to reward yourself after test season 😉) without so much actual cheese in it. 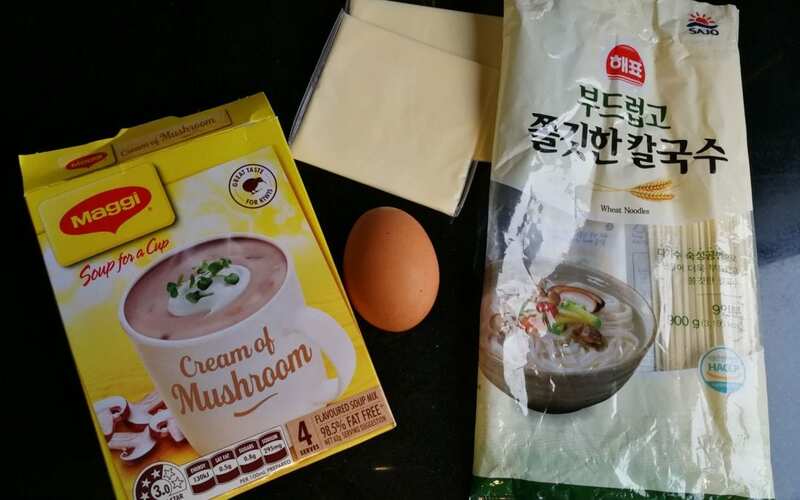 The ingredients you’ll need is Korean wheat noodles, it works with both the thick or thin types, one egg, two slices of processed cheese (I know, I know, processed cheese isn’t real cheese but trust me, it tastes better in noodles) and my secret ingredient: a packet of cream of mushroom soup. 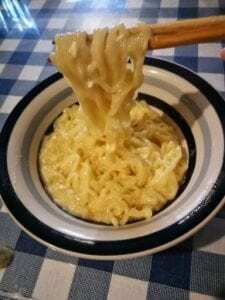 You can experiment with the ratio yourself (you can add an egg to make the noodles even thicker or take away a slice of cheese if you don’t want it to be so cheesy). Oh and it feeds two by the way! 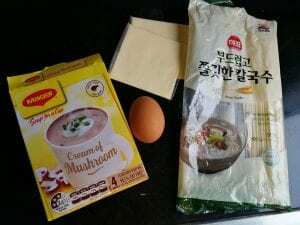 You’ll notice in the video I didn’t actually use the wheat noodles because I didn’t have enough to cook for two people, so I used these two ramen packets instead. Big mistake. The potato ramen was just way too heavy and had this weird consistency. 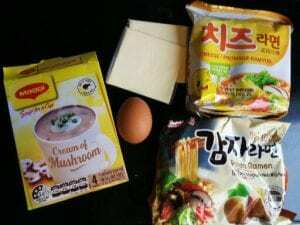 The cheese ramen (yellow packaging) is actually made for cheese so it worked better but I mixed the two so 😔. Stick with the wheat noodles and you’ll be good! As a side note: The cheese ramen (yellow packaging) is actually delicious by itself! 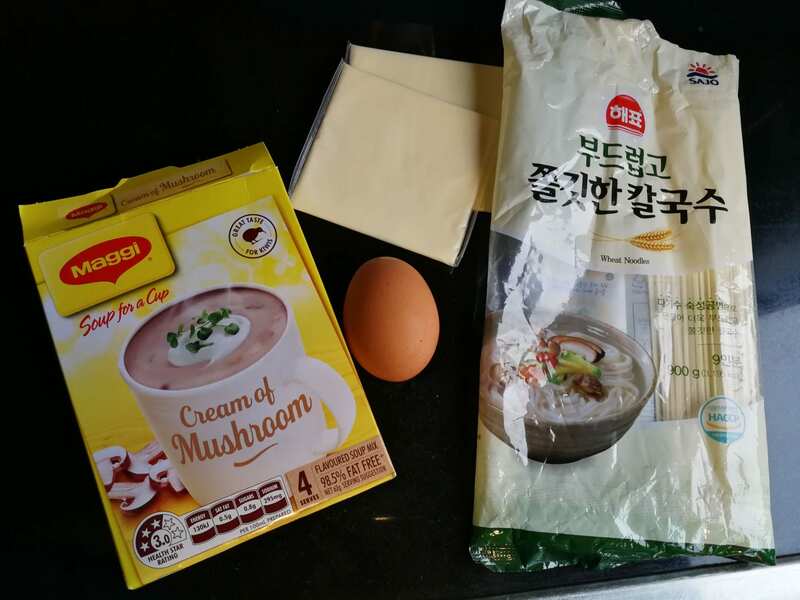 The soup base is a little spicy so adding your own cheese and egg will be the perfect compliment. Throw away the powdered cheese that comes with it, powered cheese is for the weak (jkkk, you do you, but trust me, processed is the way to go 👌). I have been told that I have weird taste in pretty much everything food so do be warned. If you don’t like cheese (I’m sorry 😔) you probably won’t like this recipe either. It looks like its drowning in cheese. Tastes like its drowning in cheese. But all of this probably only has half a slice of cheese in it!